Okay, I have been thinking about this for years now. I suppose that sounds a bit odd. Maybe even a bit crazy. To harp on something for years. But I really had no outlet to get this out of my head. So, I have this bloggy-thingy now and this is going here. If anything.. just to save my brain any further ramblings on this. For years, I’ve been getting sales adverts, flyers and catalogs. Well that happens to everyone, you say. What’s so unusal about that?? Well I have noticed that there are some that go beyond the sending an occasional advert. There are some that do what I can only refer to as harassment. Did you know that you can request to not receive ads? There are dozens of places to do this. You can even request that from the sender themselves. I have done this to rid myself of places And it works rather well as I mostly only receive catalogs that I want. However, there are some that won’t abide by the requests. Two of the companies that I have had troubles with are Bealls and Critic’s Choice Video. I did have an issue with Harbor Fright Tools. But it seems I finally got rid of them. Both happened in different ways. With CCV, I ordered from them once. I was dissatisfied with them so I tried to have them stop sending me catalogs. I called and asked them to take me off their mailing list. Each time they replied that they took me off the list, that there was no way to stop the next one, but that I would not receive any more. And each time I’d keep receiving the catalogs. I’d call again and get the same promise as before. I’ve called and spoken with Supervisors and Managers. Still I keep getting their catalogs. 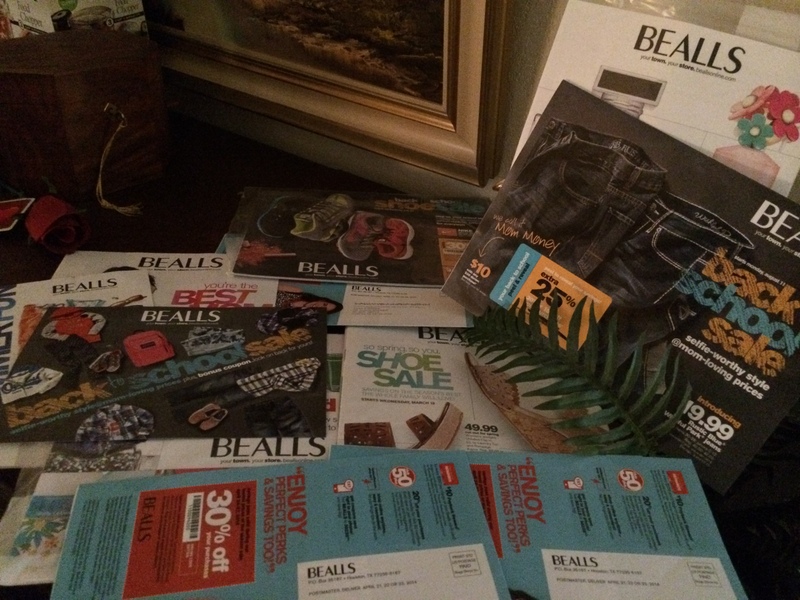 With Bealls, it started when I received a catalog with my last name but not my first name. I was very concerned that someone had my name/address and was using it. So I went into a store and asked about it. The Manager there could not find out so she referred me to a national number. I called and I’ve spoken to the Customer Service department, their complaints department, and their Fraud department. Each one said that no one had try to buy anything in that name, no accounts opened in that name, etc. They said they’d stop mailings to me with that name. Unfortunately I wish it ended there. I got more with that name on it. I called again. Again I was promised that it would stop. Soon after that, I got more but they started varying the first name. They do seem to favor the name Kara. I don’t know why. I kept calling and asking to remove me from the list. They kept promising.. and it still hasn’t happened. I have pulled out the same flyer, sent to me three times with three different names on them. All those calls, and in the end they.. “aren’t really sending them to you. It has someone else’s name on it.” Nice little trick, both of these companies. Especially as this has been going on for years. So what’s the answer? Do we have the Government take over and ‘regulate’ them? Do we elect a council to investigate and control them? I wish I knew the answer. I’d like them to step in and help me. I have this issue but with calls for donations. The Epilepsy Foundation won’t. Stop. Calling. After repeated requests. I’ve told them I donate to other causes–that my sis has ovarian cancer so that’s a priority, etc. So frickin’ rude! I found out from doing the ‘Do not call’ list uis that the Government gives Charities an exemption from these. So no matter how much you try to keep yourself away from the calls, they are allowed to call you.